Car key professionals are cheaper to hire if you ever lose your Ford car keys. Replacing the lost car key is less of a challenge than it might seem. Our technicians have become the most highly trained Ford key replacement pros in Phoenix AZ. Cars keys have the habit of getting lost underneath couch cushions or coat pockets. At times, you might be lucky to find them but on some bad hair days, they seem to disappear forever. Unlike in the 90s, it’s hard to get Ford Car keys replacements/spares from any hardware store, car dealership or locksmith shop. The main reason for this was that it was extremely easy to copy car keys in the 90s. Today, the high technology advancement makes it very hard to copy Ford car keys. This has minimized car theft cases but has made it very expensive for one to replace his/her lost keys. The good news is that some locksmiths offer Ford key Replacement services at an affordable price. The first Ford car keys came with a red chip system. Here, the transponder chip was made from clear glass and hidden inside the head of the key. These keys had a small red square at their top right corner hence the name. The master key for the red chip system had a completely red head. After sometime, the red keys were replaced by the Blue keys which also came with a transponder. Blue keys were more advanced and they aren’t entirely blue. The latest Ford keys come with a more sophisticated black carbon chip but have the blue corner. 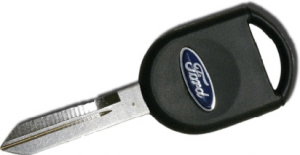 Knowing the type of your Ford keys will make replacement faster and easier for locksmiths. This is the most common Ford car key. It comes with a cylindrical shaped blade with 6 notches at the tip. These notches are cut into 4 different depths which operate the lock and are unique to only one vehicle. The key can be a remote locking key’ or a standard manual key’. The remote key has 3 buttons – early models used two buttons. As of 2007, the Ford Transit has been using a blue remote key which resembles the older systems but can’t be manually programmed. Tibbe keys are easy to replace. The locksmith will use a lock pick to gain access to your car. Once open, the depths of the lock will provide all the information necessary to cut a key. The process takes only 2 minutes. New Ford models operate with these keys. Their metal blade is flat and rectangular with a uniquely shaped groove cut down on each side. They can be manual or remote. These keys are more secure and hence harder to pick. At times, for a new key to be cut, the lock has to be removed. The HU66 Laser key system was implemented in the Ford Galaxy model shortly after its takeover. It’s much more complicated than the other two key systems. Keys that can be replaced? The best thing about AZ Car Keys is that we can program new Ford Keys without the master key. This implies that we can supply you with a new key at a cheaper price than that of the main dealer. An additional advantage is that our technicians will come to you hence you don’t have to worry about towing expenses. If you need a spare key for your car, we’ve got you covered. No matter how sophisticated a Ford car key is, it can be cut and programmed at your car within minutes. Getting a spare key is way cheaper than getting a new one. Lost my truck key and these guys were quick to get to me and program me a new key! Will use again and recommend!